Want to save money and make sure you’re eliminating preservatives? Well, the nice thing is, making Hash Browns from Scratch is really not difficult. I’ll be honest. 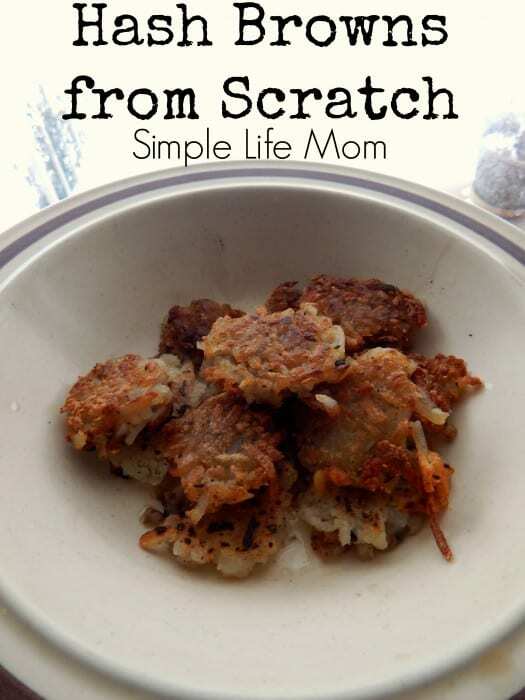 I have never in my life bought store bought hash browns, though I have had some that other people have cooked. They taste great. No problem there. But after looking into it I see that most have extra ingredients that I don’t care for. These show that the “food” is mass produced and so the nutrient level is probably much lower than if I had made the food myself. Potassium Sorbate – a now synthetically made salt, said to dissolve into water and carbon dioxide in our systems. Though with everything else scientists are finding now that actually shouldn’t have been approved by the FDA, it makes you wonder. Disodium pyrophosphate – This is added to make sure the potatoes don’t stick together and don’t discolor before cooking. From what I can tell, it is now a synthetic chemical, a white powder, and there is a warning that if used often it can cause mineral and bone lose. Sodium bisulfite – a bleaching agent. It’s a combination of sodium, hydrogen, sulfur, and oxygen. It is processed through a series of steps, some often including EDTA and other chemicals known to be harmful.1 These are most likely filtered out in the end product. Xanthan Gum – Usually made by fermenting corn or soy sugar with a bacteria called xanthomonas campestris. Xanthomonas campestris is what causes black rot on my vegetable plants. It’s horrible for gardens. But apparently our bodies can take it when it’s combined with corn sugars, dried, and powdered. It’s become popular in gluten free circles, but you should be careful if you are trying to avoid GMO or have a corn or soy allergy unless you know the source. So, how can you make your own without all that? Easy! I’ll give you the recipe and then walk you through the steps. Rub coconut oil on potatoes, poke a few times with a fork, and bake in oven (just put them on the rack, no foil) at 400 degrees until forks inserts easily. I usually do this the night before. Wait for them to brown before turning! Don't forget that you can freeze before cooking. You don't need to thaw, it will just take a few more minutes to cook. So, you will need to start by gathering how ever many potatoes you want to fix. 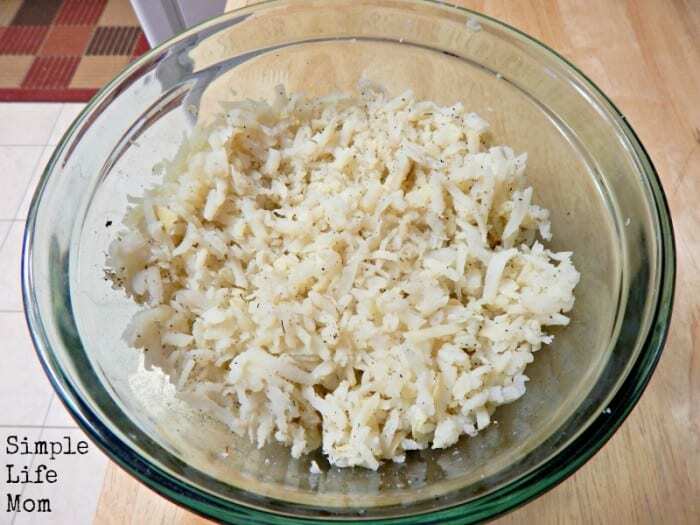 You can easily freeze your shredded potatoes for ready use later (this is what I do so I make 5-10 lbs at once). Scrub your potatoes, stick them a few times with a fork (so they don’t explode), rub with coconut oil, and place in a 400 degree Farenheit oven for about an hour. Check them to see if they’re done by sticking them with a fork or using a pot holder to give them a little squeeze. They should be soft. they will not crisp up because of that moisture and you’ll end up with Mushy Hash Browns from Scratch instead of Crispy Hash Browns from Scratch. Let those cool. I will cook them in the evening so they can cool overnight. Don’t try to peel hot potatoes. You will burn your hands! Once they’re cook they will be easy to peel and shred with a cheese grater. The first time I did that I was so surprised at how fast and easy it was. After they’re shredded you can add salt and pepper to taste. I also like to add onion powder and parsley flakes, though you can also add garlic. Now you’re ready to either freeze your cooked and shredded potatoes or brown them to eat right now. If you’re going to freeze them, then cool them in the fridge first. Then when you transfer them to the freezer they won’t end up sticking together in a massive blob. I lay them flat and about 1 inch thick in a large zip close bag. 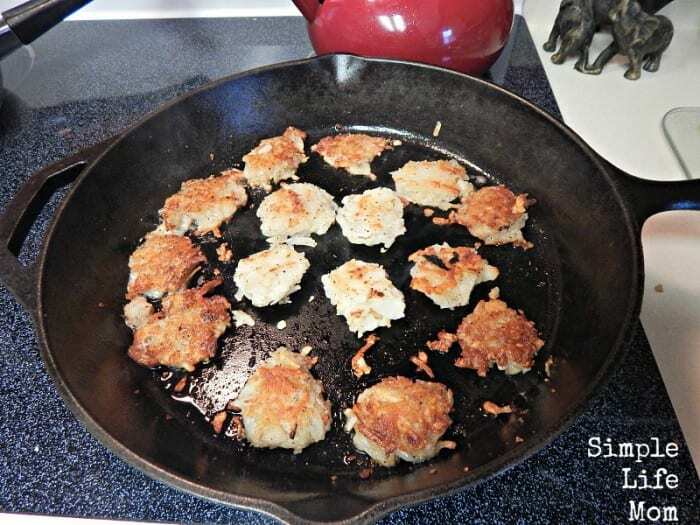 To cook them now, decide whether you’re going to stir a hash or make patties. When making the patties, don’t squish together too hard. Just gently press together and place in a hot pan with about a 1/2 inch of hot oil or butter. We made little patties this time because my kids wanted them like that, but it is more work. I usually do larger patties or a hash. If you’d rather make a hash, then just add the potatoes until they are about 1 inch thick in the pan. Just like the patties, let them brown before turning with a spatula. 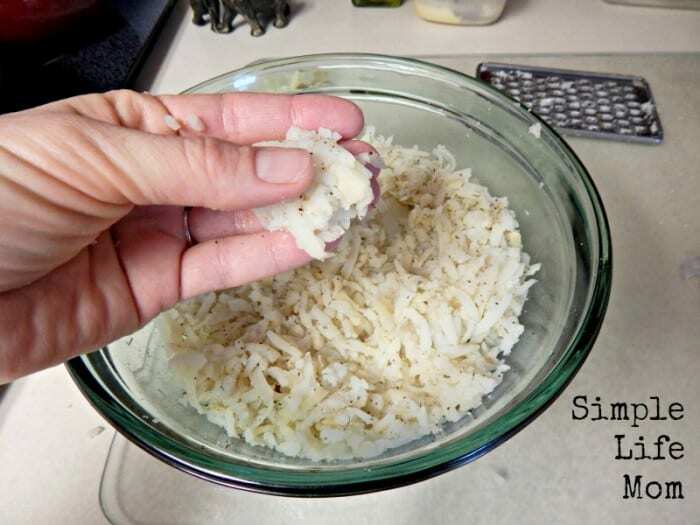 You can gently toss to keep a hash, or you can let them crisp up and cut with a knife when ready to serve. Thanks for posting this, we love hash browns but I refuse to buy frozen ones when we grow our own potatoes and are able to keep them in our cellar for several months (usually they stay good until the first of June).I’ve tried making hash browns from fresh potatoes with little success, I’m looking forward to trying this. Let me know how it works out for you. I had a disaster the first time I tried, because I didn’t cook the potatoes first. It was mush. 🙂 These should give you nice crispy hash browns. It’s been on my list to try to make these. Great tips on how to keep them crisp. Love Hash Browns, these look awesome. Hope you have a very special Mothers Day weekend and thanks so much for sharing with Full Plate Thursday this week. so have to try this, I think hubby and son would be thrilled if I made these.